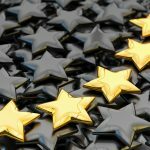 One of the big challenges for any network administrator is making sure that mission critical applications remain readily available and that they continue to perform well. 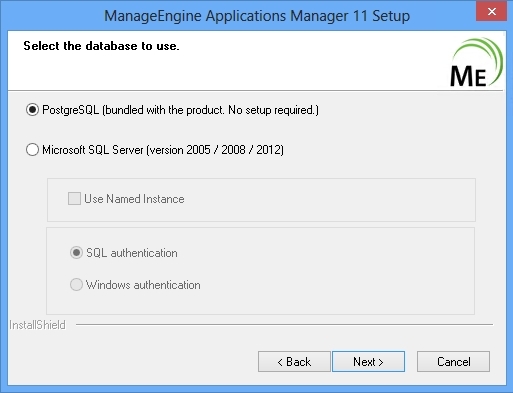 ManageEngine seeks to address this challenge with Applications Manager 11. Having heard some good things about the most recent version, I decided to take it for a test drive. I downloaded the trial version of the software here. The download page offers 32-bit and 64-bit Windows downloads, as well as Linux downloads. I found the installation process to be filled with pleasant surprises. Shortly after beginning the install, I received the screen shown in Figure A, which asked me which edition I wanted to install. 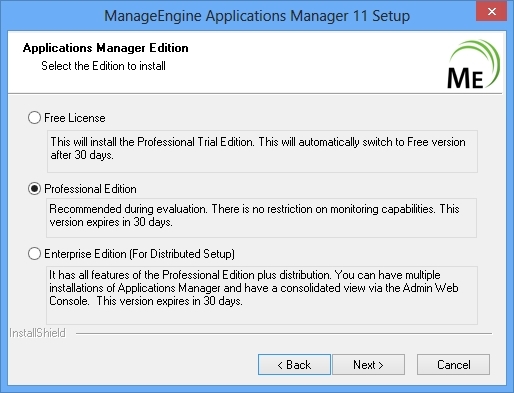 While this isn’t all that unusual, what caught my eye is that it is possible to install the Professional trial edition in a way that causes the software to automatically switch to the free edition once the trial period expires. Figure A: You have the ability to install a free version of the product. Another part of the installation process that I really liked is that Setup gives you the choice of using an existing SQL Server instance or of installing PostgreSQL. If you opt for the PostgreSQL option then SQL is automatically installed with the product and no configuration is required, as shown in Figure B. Figure B: You can use Microsoft SQL Server or PostgreSQL. As crazy as this might sound, my absolute favorite part of installing the software was an error message. By the time I had received the error I already had a favorable opinion of the installation experience, but the error really put the experience over the top. Let me explain. The Applications Manager download page had recommended installing the software on Windows 7 or Vista. Even so, I wanted to take a chance and try installing the software on Windows 8, just to see what would happen. At the end of the installation process, I received an error message stating that the server could not be started as a service. I review a lot of software products and am no stranger to failed installations. I have lost count of the number of times that I have received errors related to a service that won’t start. These errors usually lead to hours on the phone with technical support. In this case however, there was one sentence in the error message that changed everything. The actual error message (shown in Figure C) stated: “Server could not be started as a service. So it is started in a Non-Service mode”. In other words, Setup realized that there was a problem and automatically took corrective action so that I didn’t have to break out the documentation or call technical support to figure out what to do next. I wish that every software vendor had such an excellent Setup program. Figure C: Setup realized that there was a problem and automatically took corrective action! Another thing that I sometimes run into when reviewing software is that often times Setup will complete, but will leave you wondering what to do next. Applications that use Web consoles sometimes don’t include Start menu shortcuts. However, when Applications Manager finished installing it displayed a Web page that provided very clear instructions for accessing the software. Since I had taken it upon myself to use Windows 8 the instructions didn’t work for me, but that was my fault. I was easily able to launch the software by locating the shortcut in the Program Files (X86) \ ManageEngine \ AppManager folder. When I launched Applications Manager for the first time I was taken to a standard login screen, which you can see in Figure D. I was especially happy with the fact that the default username and password were displayed on the login screen. Once again, ManageEngine did not leave me guessing as to what to do next. 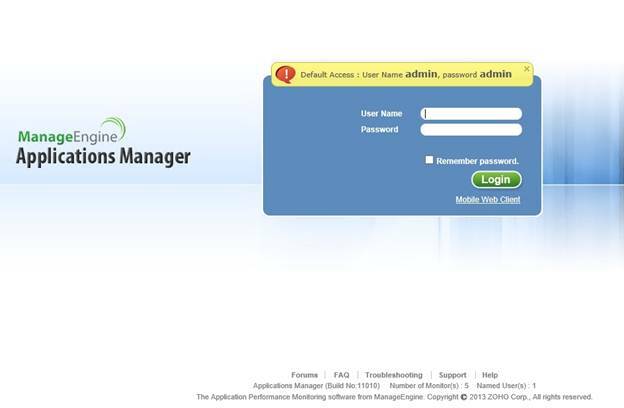 Figure D: This is the Applications Manager login screen. After logging in, I was presented with a screen that asked me to configure my mail server. I found this screen to be clean and well laid out. The screen even explained why you need to configure a mail server and ManageEngine provided a Test SMTP Server button that you can use to verify that your mail server configuration is working correctly. Once I got everything up and running I decided to create a new monitor to try the software out. I decided to initially set up a monitor for an Exchange server that I have running in my lab. Setting up a monitor proved to be a very easy and intuitive process, as shown in Figure E.
Figure E: Setting up a monitor is a simple process. It was really nice to see the software work seamlessly with various applications rather than requiring complex configurations to link the monitor to my applications. In the case of Exchange Server, I wish that the software had Exchange 2013 support, but I am sure that is probably coming eventually. 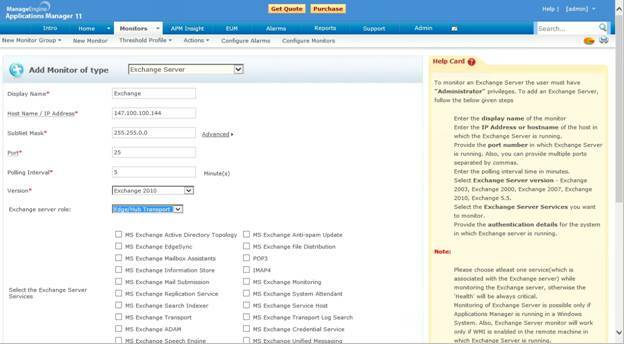 It is also worth noting that monitoring an Exchange Server requires a separate monitor for each Exchange Server role, so you can use up multiple licenses if you have multi-role Exchange servers. 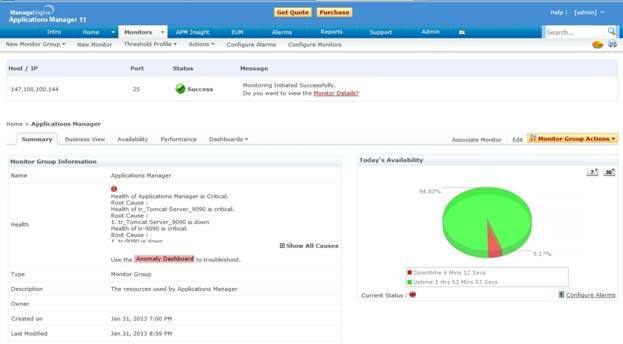 Like competing products, Applications Manager 11 can send E-mail alerts when a problem is detected and it has a very nice dashboard view that can be used to assess the health of monitored applications. The software can even report on its own health. For example, if you look at Figure F, you can see a critical issue detected with Applications Manager. The event clearly indicates that the problem was caused when the server dropped offline (I caused the error on purpose). Furthermore, the screen provides a link to an Anomaly Dashboard that you can use to troubleshoot the problem. Figure F: This is the dashboard view used to monitor application health. The pricing for Applications Monitor is based on the number of monitors and on the number of users who access the Web client. There is a free version that supports up to five monitors. If you need more monitors than that then pricing starts at $795 for a 25 monitor license. The pricing is based on an annual subscription model. I applaud ManageEngine for posting pricing information on their Web site unlike so many other enterprise software companies. When I review products for this web site, it has become customary to score products on a scale from 0 to 5 (with 5 being the best). Those who have read some of my other reviews know that I do not like to give perfect scores. There is always something that can be improved. In the case of Applications Manager, I have to give the product a perfect rating of 5.0. That’s a WindowsNetworking.com Gold Award. I just could not find anything wrong with the product. In fact, if it were up to me I would throw out the Gold Award and give the product a platinum or a diamond award if such awards existed on WindowsNetworking.com. Application Manager 11 is beyond outstanding. Feature wise, the product is in line with other application monitors that I have used. However, there are two things that really set it apart from the competition. First, the product is extremely intuitive and easy to use. That’s quite an accomplishment for an application monitor. The second thing is that throughout the entire review experience, I kept finding small things that ManageEngine had done to make the experience just a little bit better (such as some of the things that I mentioned in the section on the deployment process). These small things make a big difference in the overall experience. All in all, I am extremely pleased with this product. And in the interest of full disclosure, I want to assure you that I have no relationship with ManageEngine and that there is absolutely no bias in this review. The product really is outstanding. Download the free version and try it out for yourself.